As a contractor willing to work in the hotspots of the world, DynCorp is one of those companies that is able to prosper while the bullets are flying. Still, the company has not been exempt from the effects of the global economic downturn. In addition, with the election of Obama and the Democratic majority, investors are no doubt assuming that DynCorp's role may soon be shrinking as the administration attempts to pull back from foreign entanglements. As a result, the stock price has been under pressure until just recently. Here's something else that grabbed my attention. With the price down so low, the stock is looking very much like a deep value stock. The table below presents a number of measures. All the typical value measures are looking pretty good: PE, PEG, Price to Sales, Price to Book, Enterprise Value to EBITDA. Each is in the range that suggests the stock is far from over-valued. 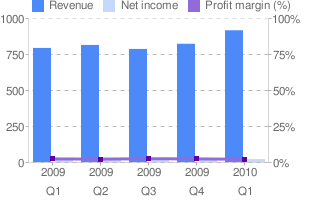 Here we can see revenue on the upswing, more so than earnings per share. In fact, EPS has been somewhat flat though, as the table above this chart shows, y-o-y EPS did show a modest 5% improvement. DynCorp's stock seems to be deeply over-sold based on its current valuation measures and stock chart. The price is finally recovering though and the chart setup is verging on real bullishness. With an upside breakout through it's trend line, the company seems to be demonstrating a nice reversal. In order to keep up the momentum, however, the company will have to prove that it can convert some of these surging revenues into improved earnings per share. With the international situation still favoring the company and its services, I suspect there isn't much risk in owning this stock at this price.